Quarter Master Bellhousing - 5.5" Steel UNIVERSAL - Dezod Motorsports Inc - Home of the automotive performance enthusiast since 2002. Many Late Model and SportMod classes mandate the use of an OEM diameter steel flexplate, T-10 style transmission and a steel bellhousing. With the lowest moment of inertia, these Quarter Master Steel Bellhousing Kits deliver improved acceleration and corner deceleration, yet still give you the maximum durability and rules legality you require. 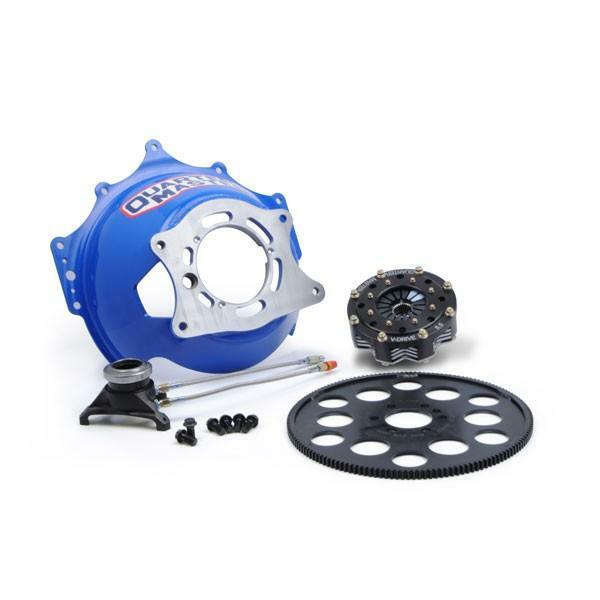 Quarter Master Steel Bellhousing Kits feature a CNC-machined, lightweight steel bellhousing to ensure concentricity for reduced wear, a scalloped flexplate to reduce the moment of inertia and a 2- or 3-disc clutch with a balanced button flywheel. Each kit is available with either a Tri-Lite or Race Throw-out Bearing. The balanced button flywheel complements the flexplate, as it provides the lightest clutch system for your performance dollar.